It took three launch windows, a handful of aborts, one new gas generator and one #spacegiving—but SpaceX did it. 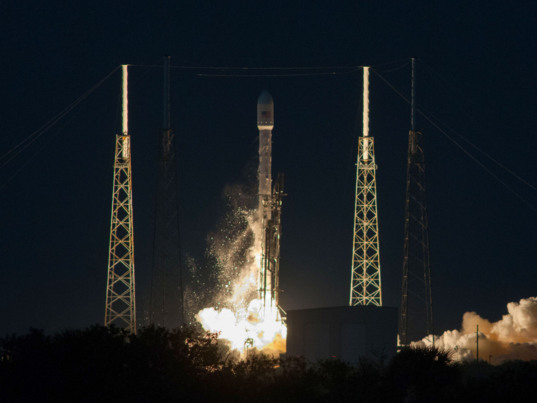 On Tuesday evening, the company’s upgraded Falcon 9 launched into the Florida twilight, carrying a communications satellite to geostationary transfer orbit. The payload was BBI—Boring But Important1. It was a communications satellite called SES-8 that will provide Internet, phone and television services to South Asia and Indochina. SES-8 was built by Orbital Sciences Corporation and is one of 55 geostationary satellites owned by Luxembourg-based SES. On Dec. 3, 2013, SpaceX's Falcon 9 version 1.1 placed a communications satellite into geostationary transfer orbit. 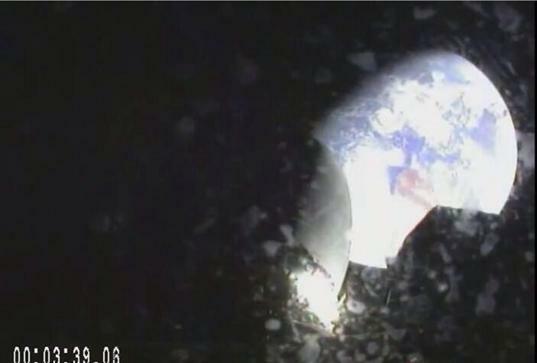 This view was taken from a camera mounted to the upper stage from an altitude of 13,000 kilometers. So what made this mission such a big deal? SES-8 is the first payload SpaceX has sent to geostationary transfer orbit. GTO is the last stop for payloads headed to geostationary orbit, where satellites cruise around the world at the same speed the Earth rotates, keeping them at a constant longitude. Geostationary orbits are more than 35,000 kilometers high—much higher than your run-of-the-mill 400-kilometer low-Earth orbit, where the International Space Station hangs out. Nailing a GTO is a job typically reserved for rockets like the Russian Proton or European Ariane 5. SES-8 gives SpaceX and its customers some confidence in the upgraded Falcon 9, and its ability to lift heavy payloads to difficult orbits. The F9 version 1.1 is now two for two, having successfully debuted in September at Vandenberg Air Force Base. The new, more powerful Falcon has a decidedly cool Octoweb design2. Eight Merlin engines circle the base of the rocket, with a ninth in the center. It was the first time the Falcon 9’s second stage Merlin 1D engine re-lit during flight. During September’s test mission from Vandenberg, SpaceX gave the re-light a shot after Falcon released its payload. It didn’t work. He was right. The engine re-lit without a problem, and SES-8 was eased into transfer orbit without a hitch. SpaceX's Falcon 9 lifts off from Space Launch Complex 40 carrying communications satellite SES-8. Musk hosted his press conference from a cell phone in Disney World, where he was spending the day with his children prior to the first launch attempt on Nov. 25. The trip, he said, has become a preflight ritual for East Coast Falcon launches. With Tuesday’s successful flight, Musk's ritual remains reliable—sort of. The Nov. 25 attempt was scrubbed due to pressure fluctuations in the first stage’s liquid oxygen tank. The second try came on Nov. 28, Thanksgiving Day, and progressed all the way to engine ignition. The liftoff, however, was aborted when the Falcon's engines did not ramp up thrust properly, triggering an automatic abort. The Falcon 9 underwent a thorough checkup. The rocket’s gas generators—which power the vehicle's turbopumps—were cleaned, and the gas generator on engine nine was swapped completely. So far, SpaceX and Orbital Sciences Corporation are the only NewSpace organizations acting as bona-fide service providers. Virgin Galactic isn’t far behind. Test flights of SpaceShip Two are getting more and more impressive, and it seems plausible we could see passengers flying sometime next year. SpaceX President and Chief Operating Officer Gwynne Shotwell outlined her company's rocket construction schedule. SpaceX’s third paid cargo run to the ISS is currently scheduled for Feb. 22. It will be the fourth flight of the Falcon 9 version 1.1 (another commercial satellite is scheduled to launch before then), and the first Dragon capsule to ride the updated rocket. The cargo run will be yet another important milestone for the company. Actually, every flight by every organization seems to be an important milestone these days. Especially for funding-starved NASA, where there isn’t much room for error on any mission, manned or otherwise. 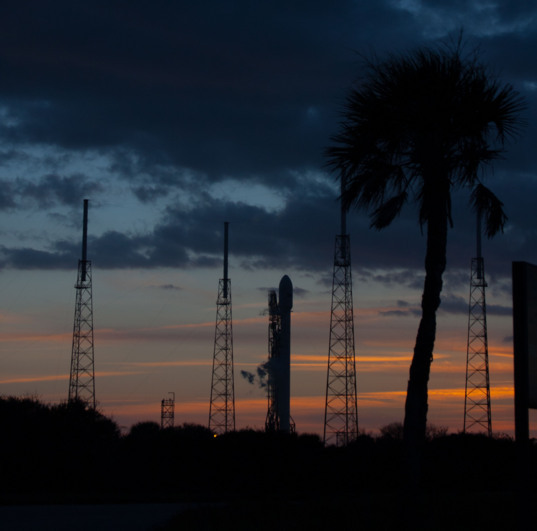 SpaceX's first Falcon 9 bound for geostationary transfer orbit sits silhouetted in twilight prior to its Dec. 3, 2013 launch. 1 In all fairness, I figure the folks at SES feel the satellite is anything but boring, as do the people in South Asia and Indochina that will use the services SES-8 provides. 2 I’m trying to think of another rocket that has used this many engines in a circular pattern. The Soviet N1, perhaps? 3 The whole battery fire scandal may be overblown, since two drivers ran over large chunks of metal, and the third hit a concrete wall. In other Tesla news, the best way to change politicians' minds on anti-Tesla legislation appears to be giving them a ride in a Tesla. 4 Now that Commercial Orbital Transportation Services has come to an end, NASA is soliciting proposals for Commercial Crew Transportation Capability, the second phase of the Commercial Crew Program. The first phase was called Certification Products Contracts. In summary: COTS is over, so now we’re on CCP. The first CCP phase was CPC and the second is CCtCap. I’m not making this stuff up. 5 It is possible that the ISS may get a lifespan extension to 2028. Great article! Best recap I've seen yet. Do you have any idea about their future plans to restart the first stage and a time horizon on their goal of landing it back safely? Hi CeeJay, last I heard, they were going to attempt some kind of recovery during the next Dragon/ISS flight. But I don't know details. Wonderful progress!! 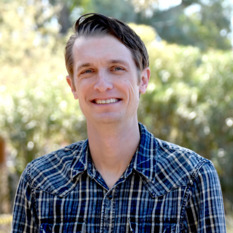 Thanks Jason for the great article!